One of the problems with having to rush to finish the Christmas present for my daughter (the toy kitchen), is that I had to skip some steps to get done in time. As I was designing as I built, I wasn’t sure which edges would end up being the outer areas of the finished product, and thus needing to be rounded over. Rounding edges over have a couple of benefits – the obvious one is removing sharp edges and corners, making them more child-friendly, and overall nicer to the whole tactile experience. The other benefit is it reduces the chance of splintering of the edges. 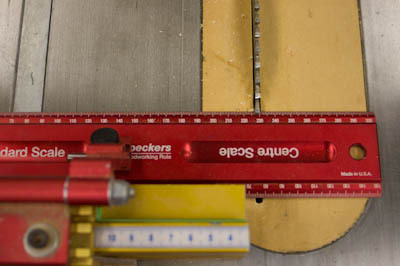 I normally like a 1/16″ roundover – the object retains the overall concept of the square edges, but with a good rounding. 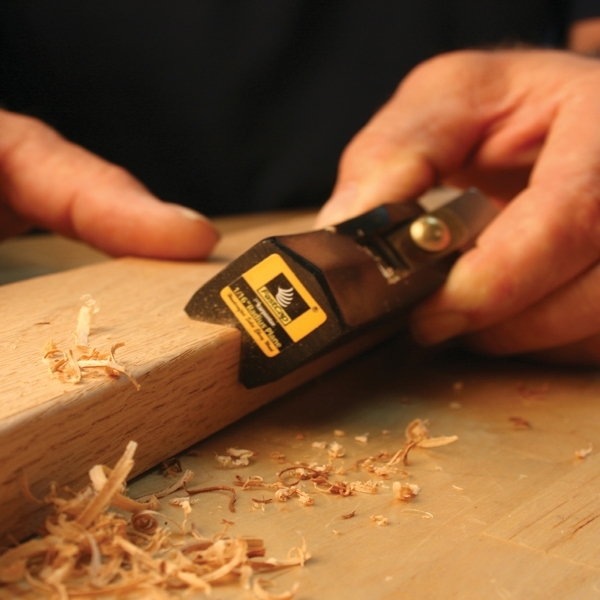 I normally use a plane to achieve this – the Fastcap Artisan Radius Plane (from Professional Woodworkers Supplies). It is a great little plane, and works really effectively. When I first got it, no edge was safe! Unfortunately for this project, as I had already assembled it, this plane is no good for getting into corners and therefore wasn’t a real option. I thought a Dremel may do the trick, even found some Dremel roundover bits in Masters. Unfortunately I didn’t read the packet, and it turned out that the bits were specifically for the Dremel Trio. 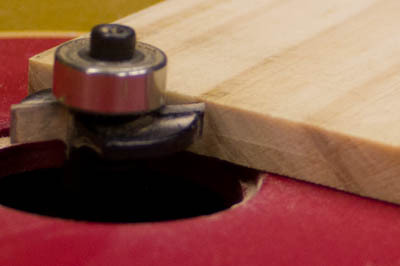 The idea of using the Dremel high speed rotary should have worked, but I have not been able to find any round-over bit that fits. So then I decided to look at the Dremel Trio – it isn’t too expensive, and seeing as I had the roundover bits, that might have been a reasonable outcome. However, once I looked at it closely, I was disappointed in the build quality, especially of the base. 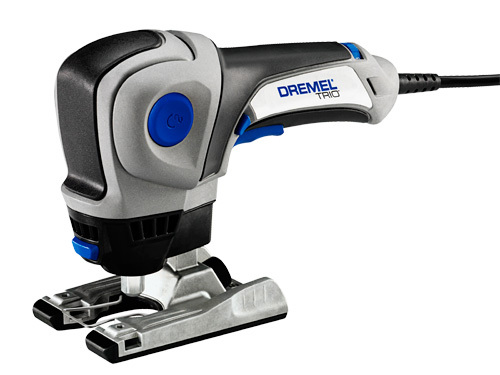 It was really the mechanism for adjusting the base that was really cheap – not the quality that I associate with Dremel, and it really put me off buying it. With the cost of the Trio, and the set of router bits I needed to get the desired roundover, that started becoming a reasonable portion of much better tools. It was about now that I was kicking myself for selling the Triton Spin Saw. Not that I have needed it until now, and holding a tool for years to finally find an actual purpose is obviously not worthwhile. 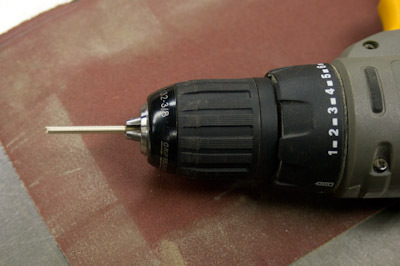 But it would have fitted the Dremel Router bits, and performed as a large version of the high speed rotary. 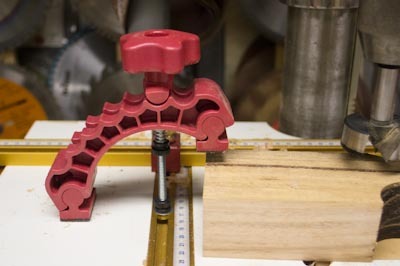 I have an old GMC Laminate Trimmer, but found that both for the size of the base, and the extension of the bearing section of the router bit, I couldn’t get into the areas I needed to. 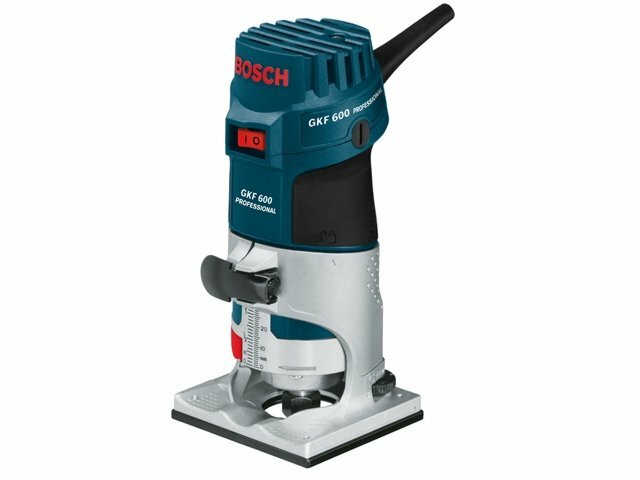 So next, I had a look at the Bosch Blue laminate trimmer, or what the actually call (and more appropriately), the Palm Router. 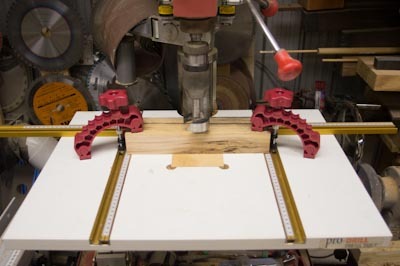 This has the benefit of taking 1/4″ router bits, and is the machine of choice for the CNC Shark & Shark Pro. A pretty good endorsement on its own! It is a very nice-looking tool, and doesn’t try to “bling-out” to create a sale. My only experience of Bosch is a corded drill I bought about 14 years ago, and despite my best efforts I haven’t managed to kill it yet. Says something about the brand. Not sure about the height adjustment on this either – seemed a bit difficult, but they may have been inexperience with the tool. Finally, I considered the Festool OFK 500 Q. 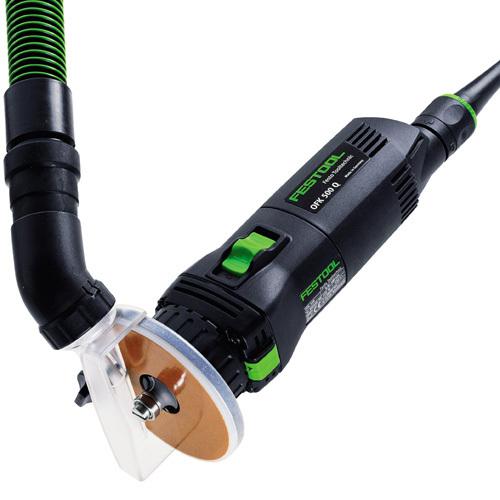 There are larger trimmers from Festool, but getting into tight areas is key. The base looks promising, and the cut-off area from one side allows it to get into pretty tight areas. 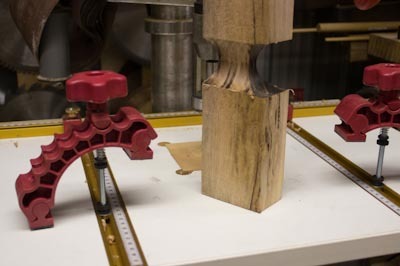 There is one ‘interesting’ feature of this tool – it takes proprietary router bits. However, it does come with what Festool calls an Ogee router bit, which everyone else calls a roundover bit, so that is a bonus. So those are the choices I am considering. The Festool is the most expensive, but as I was already willing to get the Dremel (plus the router bits) which came to $200, that is a reasonable amount off the price of the Festool, so it is more justifying the difference. Got some thinkin’ to do. 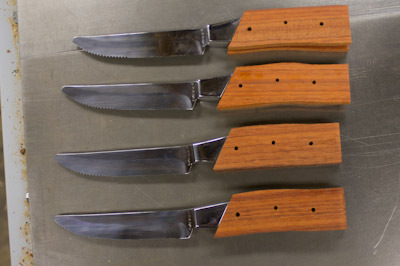 It’s only been 4 months since I got this set of steak knives from Professional Woodworker Supplies. That is a pretty quick turnaround time for me these days! Everything hasn’t gone to plan though, as I will elaborate, but I got close to achieving a good result. I don’t like accepting a compromise – it may be that others wouldn’t notice anything wrong, but I would every time I use one of these. However, I’m getting ahead of myself. 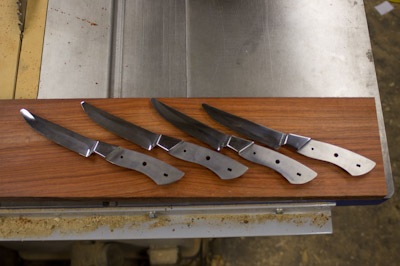 These four knives are begging for some stunning handles (the timber on either side are known as “scales”), and so the timber of choice is African Rosewood. 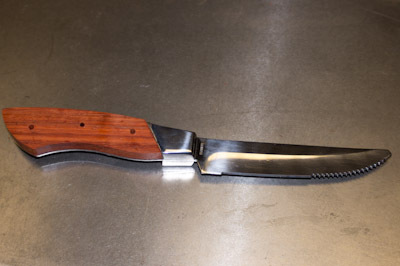 I recently bought a couple of lengths during the recent April WoodFest with the vague idea of making a box, but it jumped out at me when I was looking for what to make the knives from. 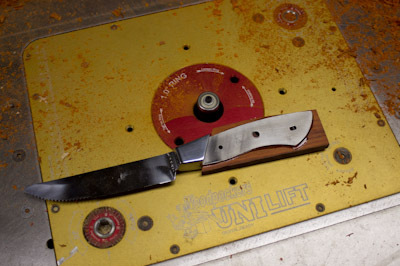 The timber is around 19mm thick, so a bit over double the thickness required for each side of the knife. So resawing was the order of the day. 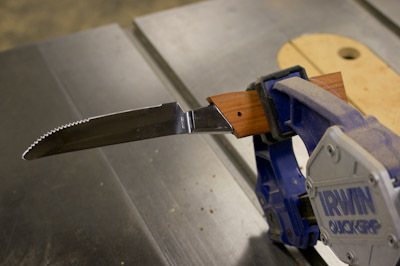 I changed the blade down to a 5/8″ blade on the Carbatec bandsaw, then racked up the tension. With the MagSwitch fence in place (single roller), the blade sliced the timber cleanly in two. 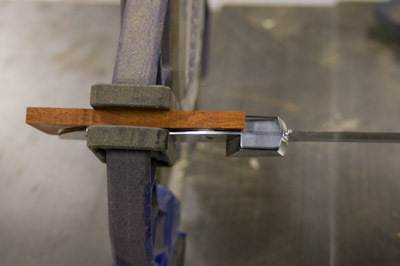 I am so loving having the bandsaw tensioning handle below the upper wheel. 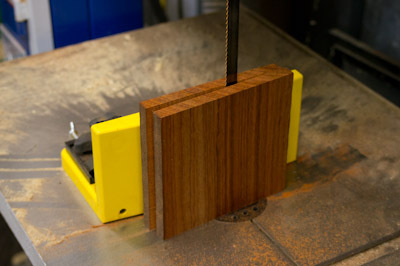 The benefits of a larger bandsaw. Can’t beat those MagFences either for resawing. Love how easy, and accurate it makes the task. 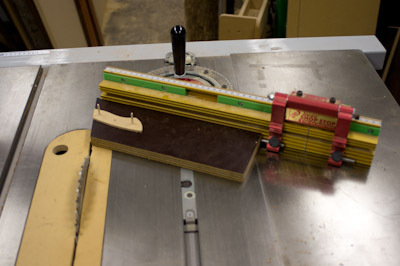 From the bandsaw, the next step is to run it through the drum sander. 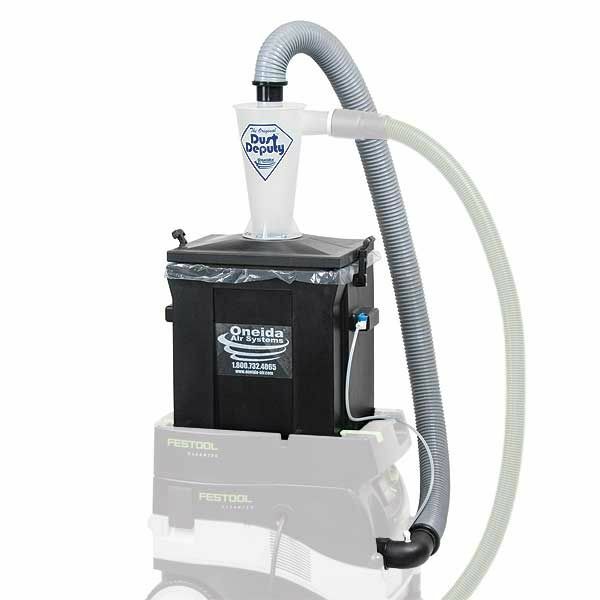 This may not be everyone’s first choice – for one you have to have a drum sander to be able to use it. I’ve become a big fan, especially for situations like this. 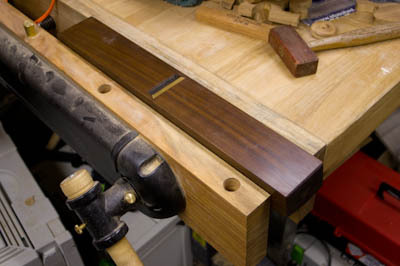 These are pieces of timber way too short to ever consider running through a thicknesser, so you’d have to resort to a ROS, hand plane or similar. Me, I like the electron-murdering whirling abrasive wheel! 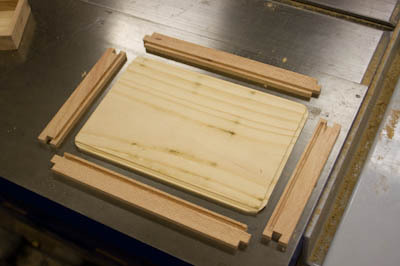 With careful passes, I was able to get the board down to within 0.1mm of the required thickness. Next job was to shape the scales. The only important side initially is the edge that butts up against the bolster. To save on timber (a big mistake – not how I chose to do it, but any attempt to scrimp on timber inevitably leads to undesirable results, and more timber wastage. 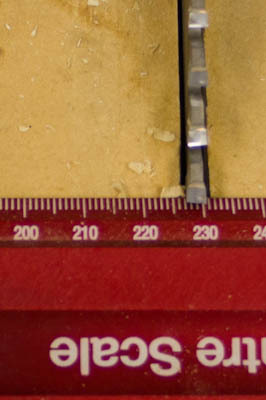 I know this, and still find myself doing it), I cut the timber close to dimension, and drilled holes using an MDF template I made of the scale from the knife tang. 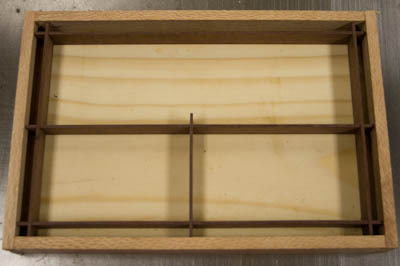 I used a couple of lengths of brass rod to replicate the rivets to position each scale to be cut precisely. 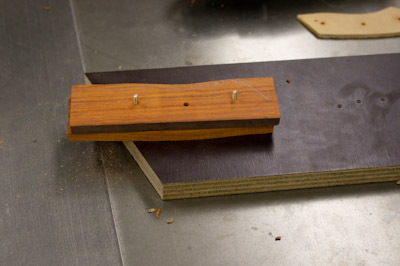 For the two pins, I needed them a little thinner than the rivets would be, so I could get the scales off the jig. 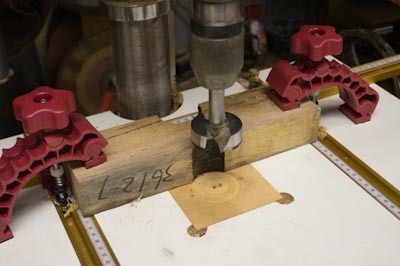 To take off a small, controlled amount, mounting the pin in the drill, then running it on the sandpaper provided a precise size decrease. 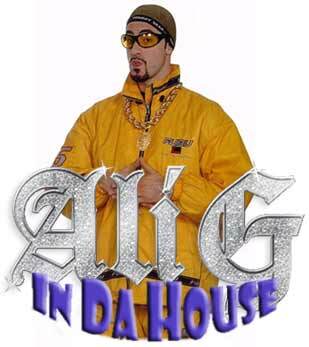 In hindsight, doing it this way was a mistake. Drilling the holes for the rivets needed to be done after the first scale was glued to the tang. The scales, ready to be glued on. 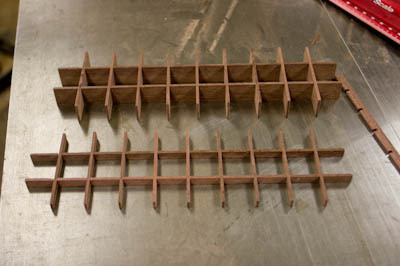 Rather than gluing both sides at once, the plan was to do one side only, then use a pattern copying bit to get the scale to accurately match the tang. Two part epoxy resin (Araldite) being the glue of choice. There is plenty of overhang which is a good thing, but this is where two mistakes compounded. The trying to be too thrifty which resulted in the scale slipping in a couple of cases enough that the tang wasn’t properly covered, and when the glue had set, not trimming off the excess resulted in a couple of chipouts on the router table that destroyed the handle. 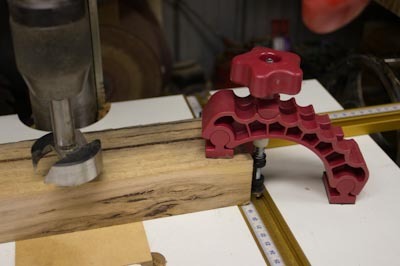 The router bit here is a straight bit with copying bearing. Straight after this, I was down at Carbatec and picked up a solid carbide spiral router bit with double bearing – the spiral has a shearing/slicing action rather than a chipping action for the next time I attempt to make more handles. Did have a couple of successes, the bearing running on the tang so the scale gets cut accurately to match. The results were looking good, and the few refinements to my technique should prove very successful. For the handles here, I took the photos, then took a chisel and snapped the scales off. Oh well, I’d rather it right than compromise. 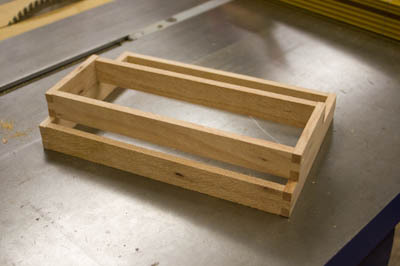 I’ve always wanted to do inlays, be that detail for boxes, or adding that something extra to other projects, but it always did seem to large a mountain to climb to work out how to do it, and more precisely, to get the templates just right to make it work. There is a secret (not a very well kept one mind! ), and it actually comes down to the template guide moreso than anything else. 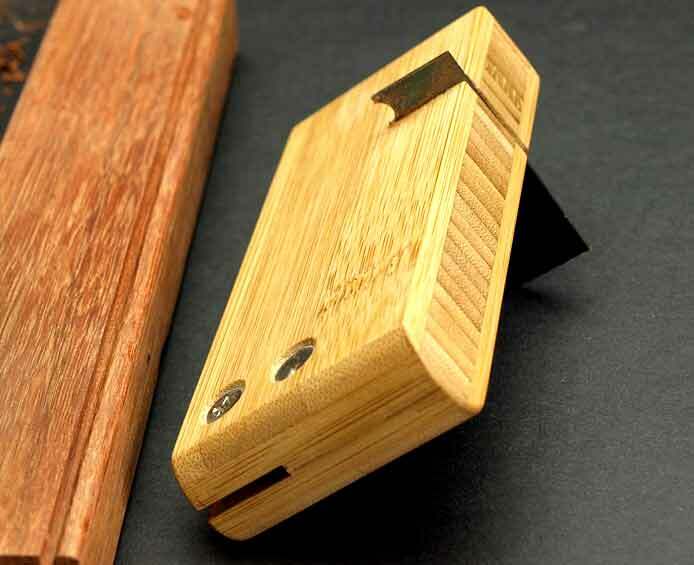 In a collaboration with Woodpeckers and Whiteside (and Professional Woodworkers Supplies who are bringing them into Australia), there is a kit available which makes doing an inlay a breeze. And I mean really, really easy. This is my very first attempt to ever do an inlay in a contrasting coloured timber. On the right side, we have an inlay of a contrasting timber (which in this case happened to be approx 3mm thick), which is completely flush with the pine. Pretty clever eh, even if I did do it myself! On the left, you can see a cut out, and that is simply because I used this test piece as the backing for cutting out the contrasting heart. There is a video btw, and it will be on Stu’s Shed in a couple of days. As you can see there are 2 of each pattern, and to give a rough idea of sizes, the smaller ones are approx 3″ high, and the larger 4″. 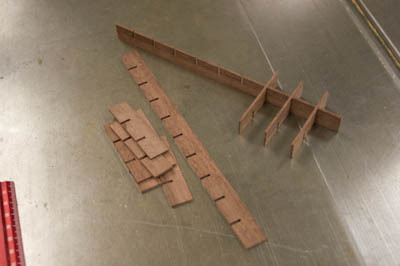 (which is both a mechanically strong, and decorative panel joinery method), and a circle template for ….. um….. circles! 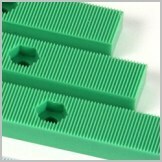 Particularly beneficial for both contrast inlays, as well as simply producing accurate, larger diameter holes. 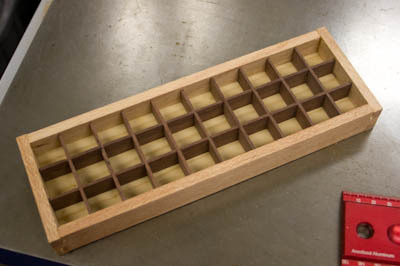 you could, with a little thought, produce your own in timber – so much nicer! Tempted to make you wait for the video……. oh, all right – here’s the short version. The kit comes with a 1/8″ diameter solid carbide spiral router bit (on the right) with a 1/4″ shank. 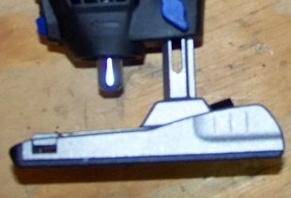 Next to it is an alignment pin so you can accurately centre the template guide. Finally, you have the template guide itself. It is a pretty standard size (unless you are using a Triton router for example, which uses the 50mm or so templates) so fits a number of routers. 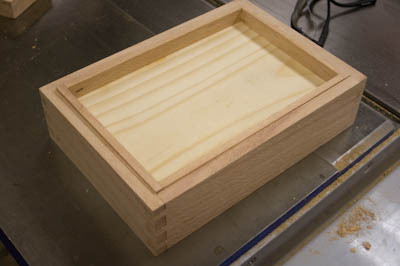 If not, as was the case for me, it didn’t fit my router, until I added the Woodpeckers router base that is! Update – not exactly true – as revealed by Hugh, and further clarification in this post. There might seem to be a LOT of holes in this phenolic plate, and in fact the one I have has even more! It is so the plate can fit almost any router, and definitely includes the Triton router. 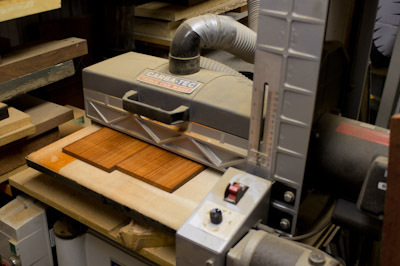 I’ve added this to my 1400W router, and will probably leave it on permanently, so I can continue to use the different template guides. The centre hole is perfect for the brass guides. Back to the template guide. 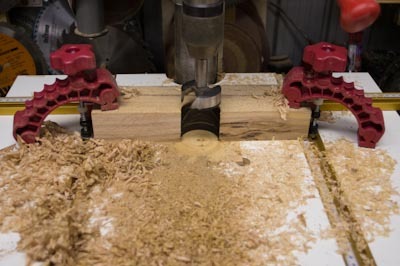 It is designed specifically to work with the 1/8″ router bit. There is a brass disk in the earlier image. 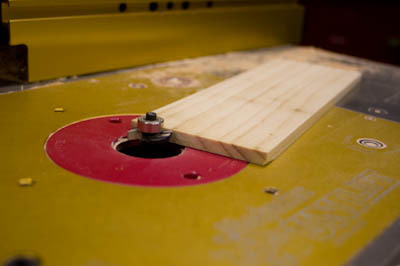 When cutting out the cavity, this disk is fitted to the template guide. An O Ring inside the ring ensures it stays in place. 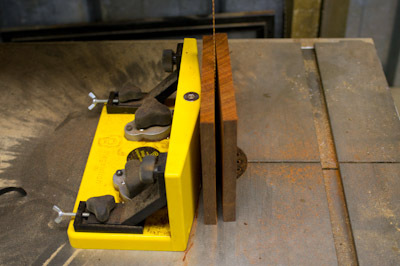 Next, this disk is removed, and the same template is used to cut out the contrasting timber. That’s about it – a really simple evolution in the end, and a classy finish. So as mentioned, there will be a video out in the next couple of days so keep an eye for that.